Turkey Time Classic Slot Guide & Review - Casino Answers! 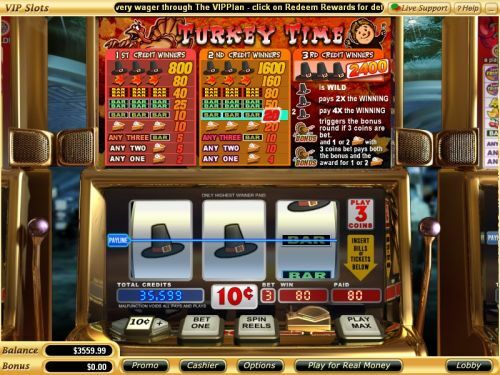 Turkey Time (also known as Holiday Feast) is a 3-reel, 1-line classic slot machine developed by Turkey Time, featuring a wild symbol, multipliers and bonus game. You can play the Turkey Time classic slot machine at Bovada. Bets on the Turkey Time slot machine are $0.10, $0.25, $0.50, $1, $5 and $10. You can bet 1-3 coins on a spin. Turkey Time is a dime slot so you can bet anywhere from ten cents up to $30 per spin. For a reel slot machine, Turkey Time has an impressive betting range. To play Turkey Time with all 3 coins per spin, hit the “Play Max” button. Casino Answers recommends that you play the maximum bet at all times on Turkey Time to get the most value out of the slot game. For all other bets, you can hit the “Spin Reels” button. The highest paying symbol on the Turkey Time slot game is the Pilgrim Hat symbol. On a 3-coin maximum bet, 3 Pilgrim Hats on the payline will pay out the 2400 coin top jackpot. The Pilgrim Hat symbol is wild and will substitute for all symbols except for the Turkey symbol. It will also multiply your winnings by 2X or 4X. You can use this symbol to win big at Bovada. There are 9 winning combinations on the Turkey Time slot machine. The full payout schedule on the Turkey Time classic slot machine are as follows (1/2/3 coin payouts in parenthesis): 1 Pumpkin Pie symbol (2/4/4), 2 Pumpkin Pie symbols (5/10/10), any 3 Bar symbols (5/10/10), 3 Pumpkin Pie symbols (10/20/20), 3 Single Bar symbols (10/20/20), 3 Double Bar symbols (25/50/50), 3 Triple Bar symbols (40/80/80), 3 Leaf symbols (80/160/160) and 3 Pilgrim Hat symbols (800/1600/2400). If you are in need of a simple Thanksgiving slot machine to grow your Thanksgiving appetite, Turkey Time is the slot for you. You can play Turkey Time after you sign up and make a deposit at Bovada. Can players from the United States play the Turkey Time online slot? Players from one of the two countries that celebrate Thanksgiving are allowed to play the Turkey Time online slot game for real money. Americans can sign up at Bovada to play Turkey Time. Would I be able to play a free Flash game of the Turkey Time slot? Unfortunately, Turkey Time is not offered at Vegas Tech Instant Play Flash casinos. However, you can play a wide selection of the other Vegas Tech slots at Bovada. What thanksgiving slots are there? Where can I play the Holiday Feast slot game?